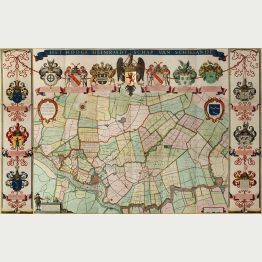 Rare, well preserved wall map of the province Utrecht by B. de Roy. Printed in 1743 by Covens and Mortier. Rare and very decorative wall map of Zijpe in Noord-Holland by J. C. Zoutman. Printed in 1665 in Amsterdam.